After Thanksgiving, there was some extra canned pumpkin left over from a pie my mom made. I stole it. I figured it would be a good time to try out a pumpkin spiced coffee drink because I'd been craving one ever since the pumpkin pie aroma filled the air. And I'm always trying to come up with new ideas for drinks, whether they're hot or cold, because beverages can be just as exciting as food! I don't like to pay a bunch of money for a simple drink at one of those coffee shops either so I'll sometimes whip up my own versions. I actually quit drinking coffee for a few years but have recently started revisiting the addicting drink. I've never been one to be affected by the caffeine in coffee, but the multitude of things you can do with it is addicting in itself. I like the coffee creamers that you can by at the store, specifically the new almond joy one, but I'll usually use what I have on hand to save some money. I've even created a quickie french vanilla version by using vanilla extract and some other ingredients...maybe there will be a post on that later. 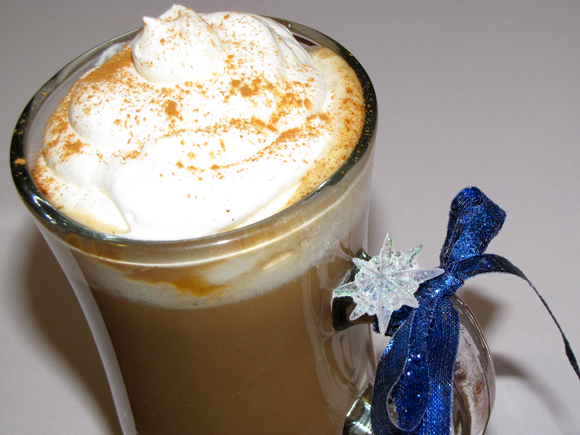 This pumpkin spice latte is a take on the pumpkin spice coffee creamer. It has a richer flavor and is thicker and creamier, which warms you up on those chilly mornings or nights cuddled up on the couch. It's really easy to make, too, so if you have a can of pumpkin sitting around, give it a try. I bet you'll find it hard to go back to the store-bought kind. 1. Bring milk, pumpkin, pumpkin pie spice and sugars to an almost boil in a saucepan, whisking almost continuously. 2. Remove from heat and whisk in vanilla extract. 3. Pour half the milk/pumpkin mixture into a mug and top with half the coffee. 4. Taste and adjust sugar, if need be, to suit your tastes. 5. 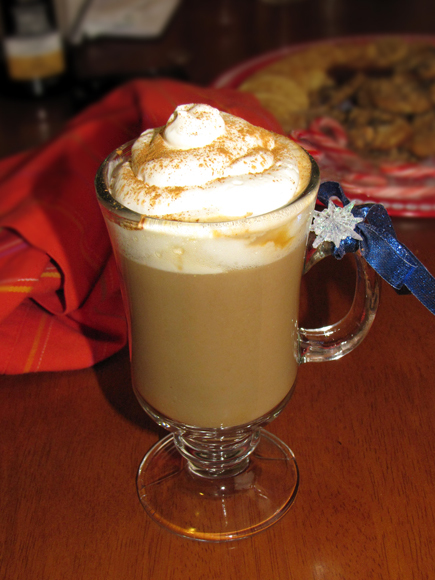 Top with whipped cream and a sprinkle of cinnamon.